In ditching the Paris accord on climate change, President Trump has cemented his reputation as the international disrupter in chief with the latest in a string of decisions that foreign policy analysts believe could have profound consequences for U.S. global leadership. The decision to exit the Paris agreement is sure to anger many of the almost 200 nations that signed the commitment to reduce emissions. In one sign of shifting alliances, the European Union and China were expected to issue a joint statement Friday vowing to take a leading role in stemming climate change. China in particular is expected to fill any leadership vacuum created by the U.S. retreat, both in climate change and trade. Many in the foreign policy establishment believe the pullbacks have undermined U.S. influence and credibility. Now, China is positioned to move into the void left by the United States. At the World Economic Forum in Davos, Switzerland, this year, Chinese President Xi Jinping gave a speech extolling the virtues of globalized trade as the United States appeared to be turning inward. The U.S. abandonment of the Paris accord represents another opportunity. 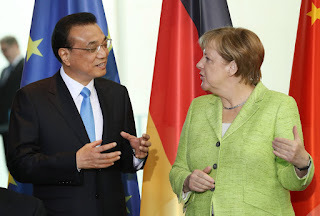 On Thursday, Chinese Premier Li Keqiang stood beside Merkel in Berlin and declared the fight against climate change a “global consensus” and an “international responsibility.” He noted that China was one of the first countries to ratify the Paris accord. As Donald Trump does his best to destroy the world’s hopes of reining in climate change, let’s be clear about one thing: This has nothing to do with serving America’s national interest. The U.S. economy, in particular, would do just fine under the Paris accord. This isn’t about nationalism; mainly, it’s about sheer spite. About the economics: At this point, I think, we have a pretty good idea of what a low-emissions economy would look like. I’m sure that energy experts will disagree on the details, but the broad outline isn’t hard to describe. Clearly, it would be an economy running on electricity — electric cars, electric heat, with internal combustion engines rare. The bulk of that electricity would, in turn, come from nonpolluting sources: wind, solar and, yes, probably nuclear. Meanwhile, there would be compensating benefits. Notably, the adverse health effects of air pollution would be greatly reduced, and it’s quite possible that lower health care costs would all by themselves make up for the costs of energy transition, even ignoring the whole saving-civilization-from-catastrophic-climate-change thing. The point is that while tackling climate change in the way envisaged by the Paris accord used to look like a hard engineering and economic problem, these days it looks fairly easy. We have almost all the technology we need, and can be quite confident of developing the rest. Obviously the transition to a low-emissions economy, the phasing out of fossil fuels, would take time, but that would be O.K. as long as the path was clear. Why, then, are so many people on the right determined to block climate action, and even trying to sabotage the progress we’ve been making on new energy sources? Don’t tell me that they’re honestly worried about the inherent uncertainty of climate projections. Don’t tell me that it’s about coal miners. Anyone who really cared about those miners would be crusading to protect their health, disability and pension benefits, and trying to provide alternative employment opportunities — not pretending that environmental irresponsibility will somehow bring back jobs lost to strip mining and mountaintop removal. Pay any attention to modern right-wing discourse — including op-ed articles by top Trump officials — and you find deep hostility to any notion that some problems require collective action beyond shooting people and blowing things up. Beyond this, much of today’s right seems driven above all by animus toward liberals rather than specific issues. If liberals are for it, they’re against it. If liberals hate it, it’s good. Add to this the anti-intellectualism of the G.O.P. base, for whom scientific consensus on an issue is a minus, not a plus, with extra bonus points for undermining anything associated with President Barack Obama. And if all this sounds too petty and vindictive to be the basis for momentous policy decisions, consider the character of the man in the White House. It will be divine justice if China rises to the challenge and takes over American leadership on international trade and climate change. One can only hope that the cretins and morons that Trump is pleasing by such harmful actions suffer immeasurably as the consequences come home to roost. Meanwhile, take a good look at Britain which in a similar form of wrongheaded xenophobia has marginalized itself through its Brexit vote to a point where no one seemingly cares what happens there. America is marching down a similar road. I hope people remember those responsible for this diminishing of America.